The Kerner Commission reported back that “white racism” was the cause of black riots. Liberals bought it. America did not. The Nixon-George Wallace vote in 1968 was 57% to Hubert Humphrey’s 43. In 1972, Wallace was leading in the popular vote in the Democratic primaries, when he was shot in Laurel, Mayland. In November 1972, Nixon and Agnew swept 49 states. Among the primary causes of the ruin of FDR’s great coalition, and the rise of Nixon’s New Majority, was the belief in Middle America that liberals were so morally paralyzed by racial guilt they could not cope with minority racism, riots and crime. That same moral paralysis is on display in the aftermath of the grand jury conclusion that Officer Darren Wilson acted in self-defense when he shot Michael Brown on August 9 in Ferguson, Mo. But, day by day, new facts emerged. The “gentle giant” Brown had, 15 minutes earlier, pulled off a strong-arm robbery, grabbing a store clerk half his size by the throat while stealing cigars. And Brown was in the middle of the street, and maybe high on marijuana, when he refused an order to move onto the sidewalk. Then came leaks from the grand jury that the 6’4”, 292-pound, 18-year-old punched the officer in the face in his patrol car and went for his gun, which fired twice, wounding Brown in the hand. Several grand jury witnesses perjured themselves by testifying that Wilson shot Brown in the back. All of Brown’s wounds were in the front. Others said Brown turned and faced Wilson, with four of them saying Brown moved toward or charged the officer. The pattern of shells from Wilson’s gun indicates he was backing away while firing at Brown. The grand jury concluded that not only did most witnesses support Wilson’s version, but the forensic evidence was consistent with what Wilson said had happened, and contradicted Brown’s lying companion. No jury, based on the known evidence, would conclude “beyond a reasonable doubt” that Wilson committed murder or manslaughter. Yet, Michael Brown’s death, whatever the grand jury decided, is an irreversible tragedy, horrible for his mother and father. For a week, mobs blocked highways, bridges and commuter trains from New York to Oakland. The Macy’s Thanksgiving Day parade was disrupted. On Black Friday, the busiest shopping day of the year, moms and their kids at malls had to climb over unruly protesters to do their Christmas shopping. The civil rights of law-abiding Americans were systematically violated. Neither Barack Obama nor Eric Holder has yet to stand up and declare, unequivocally, that, in America, the full force of law will be used to halt, prosecute and punish those guilty of mob violence, no matter the nobility of the “cause” in which it is being committed. Make no mistake. The Ferguson riots of recent months were like neighborhood cookouts compared to Watts in ‘65, Detroit and Newark in ‘67, and Washington, D.C., and a hundred other cities after the 1968 assassination of Martin Luther King, Jr. But the reaction of our political, media and moral elites seems even more irresolute than that of the liberals of the 1960s. Only three weeks in office, Eric Holder called us “a nation of cowards.” Observing his and his boss’ performance in the wake of the Ferguson riots and other rampages, the same words come to mind. After suffering stinging defeats in the 1960 presidential election against John F. Kennedy, and in the 1962 California gubernatorial election, Nixon’s career was declared dead by Washington press and politicians alike. Yet on January 20, 1969, just six years after he had said his political life was over, Nixon would stand taking the oath of office as 37th President of the United States. How did Richard Nixon resurrect a ruined career and reunite a shattered and fractured Republican Party to capture the White House? In The Greatest Comeback, Patrick J. Buchanan—who, beginning in January 1966, served as one of two staff members to Nixon, and would become a senior advisor in the White House after 1968—gives a firsthand account of those crucial years in which Nixon reversed his political fortunes during a decade marked by civil rights protests, social revolution, the Vietnam War, the assassinations of JFK, RFK, and Martin Luther King, Jr., urban riots, campus anarchy, and the rise of the New Left. Using over 1,000 of his own personal memos to Nixon, with Nixon’s scribbled replies back, Buchanan gives readers an insider’s view as Nixon gathers the warring factions of the Republican party—from the conservative base of Barry Goldwater to the liberal wing of Nelson Rockefeller and George Romney, to the New Right legions of an ascendant Ronald Reagan—into the victorious coalition that won him the White House. How Richard Nixon united the party behind him may offer insights into how the Republican Party today can bring together its warring factions. 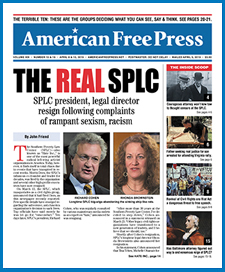 COMES WITH A FREE 1-YEAR DIGITAL SUBSCRIPTION TO AMERICAN FREE PRESS, America’s Last Real Newspaper, a $15 value! The rioting, looting, arson and gunfire that began after McCulloch relayed the grand jury’s decision, a decision long predicted and anticipated, revealed the unspoken truth about Ferguson. One recalls that the Detroit riot of 1967 was the beginning of the end of Motown. And it was decades before D.C. fully recovered from the riot and arson that followed the assassination of Martin Luther King, Jr.
That 10 o’clock split screen of Obama in the White House briefing room calling for peaceful protest and greater efforts by police to understand “communities of color,” side by side with graphic video of mob mayhem in Ferguson, tells a sad truth. We are now half a century on from the Civil Rights Act of 1964. Blacks have risen out of poverty and the working class to become successes as actors, artists, athletes, executives, politicians, TV anchors, journalists, scholars, generals, authors, etc. Indeed, we may be slipping backward. “Where is the black leadership now?” asked Juan Williams of Fox News. Indeed, where? Unfortunately, many are openly pandering to the crowd, denouncing the prosecutor, denouncing the grand jury, denouncing the Ferguson cops, but tongue-tied when it comes to denouncing the thuggery of black youth on the streets of Ferguson. Now there’s a lion of the law. Patrick J. Buchanan is the author of the new book THE GREATEST COMEBACK: How Richard Nixon Rose From Defeat to Create the New Majority. The White American chickenshits and crossbreed mutants are not only cowards, but also defenders of violent Zionist regime and its cops. You have and had an amazing opportunity to join the Blacks and overthrow your violent Zionist regime. As always, the chickenshit caved in.